2x4 inch square corner 25 mil magnets are a great option for business cards. This product can be customized with service information, contact information, a company logo etc. This magnet assures brand visibility and strong promotional results. These go great on refrigerators, kitchen cabinets, office cabinets, filing cabinets, appliances, vending machines, lockers or on any metal surface. 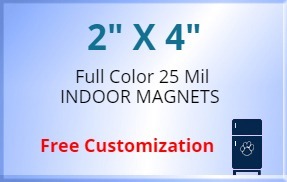 These magnets are an affordable method of bulk brand promotion.